Remember Rawhide? “Get ’em up, move ’em out!” hollered the trail boss. Here at Rockin’ R Ranch, we do exactly that-we gather up hundreds of head of cattle and move ’em out to different grazing locations. 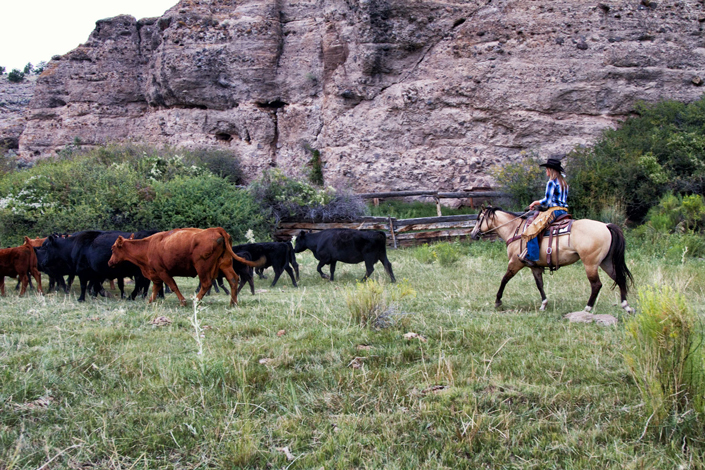 On any of the authentic cattle drives we sponsor, you’ll help move cows and their calves to lush green valleys, rugged foothills, or steep mountain tops. Ride to your heart’s content. This experience is invigorating and challenging. You must be physically fit, at least an intermediate rider, and able to get on and off your horse from the ground without assistance. Our trail boss will guide you to the horse that matches your riding skills for the cattle drive. If you arrive as a “dude”, you’ll definitely leave as a cowboy. Explore the beautiful countryside encompassed in the unlimited acres on and around Rockin’ R Ranch. Travel through the unparalleled beauty that is part of America’s vanishing wilderness. We take you along the mountainous edge overlooking spectacular views of the Grand Staircase Escalante National Monument, where you can see for hundreds of miles from vantage points as high as 11,000 feet, this is all part of the western cattle drive. While you’re here, you’ll discover one of the miracles of the West: time stands still when it comes to moving cattle!